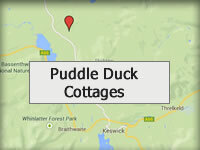 Puddle Duck Cottages are located in the heart of Bassenthwaite Village in the Northern region of The Lake District National Park, Cumbria approximately 15 mins’ drive from the towns of Keswick and Cockermouth. Our cottages are an excellent base to explore some of the quieter corners of the Lake District. Bassenthwaite Village is two miles from the shores of Bassenthwaite Lake (an ideal walk to the only official lake in the Lake District!) and two miles from the foot of Skiddaw, the fourth highest mountain in the Lake District. There are excellent walks for all abilities straight from the cottage door or after a short drive and a series of walk books of the local area is available with proceeds to cancer research. Keswick is a magnet for the Lake District visitor with Derwentwater (lake), several parks including crazy golf, mini golf and putting, all its outdoor shops, cafés, restaurants, galleries, museum, cinema, theatre, brewery and more. Keswick Mountain Festival – Activity based Festival held in May. Film, Lectures, seminars and activities for all outdoor enthusiasts. Georgian Fair – Cockermouth. A tribute to the Georgian heritage of Cockermouth. Touch a Truck Show – Cockermouth Truck Show. Chase Adventure Centre – Organised activities for all grades in Climbing, Canoeing, Gyhll Scrambling etc. Lake District Walks – Routes, pictures etc. for Lake District Walks. The Official Keswick Website – Keswick.org – Keswick Tourism Association, Accommodation, Walking Routes, Activities, Attractions, Adventure, Travel Timetables, What to see and What to do, and much more.